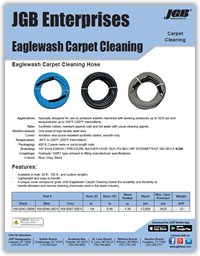 Eaglewash Carpet Cleaning Hose - JGB Private Brand - Hose by Vendor - JGB Enterprises, Inc. Synthetic rubber, resistant against cold and hot water with usual cleaning agents. One braid of high tensile steel wire. Abrasion and ozone resistant synthetic rubber, smooth only. Hydraulic 100R1 type crimped to fitting manufacturer specifications. A unique cover compound gives JGB Eaglewash Carpet Cleaning hoses the durability and flexibility to handle abrasion and normal cleaning chemicals used in the wash industry. in. in. in. psi psi lb./ft.